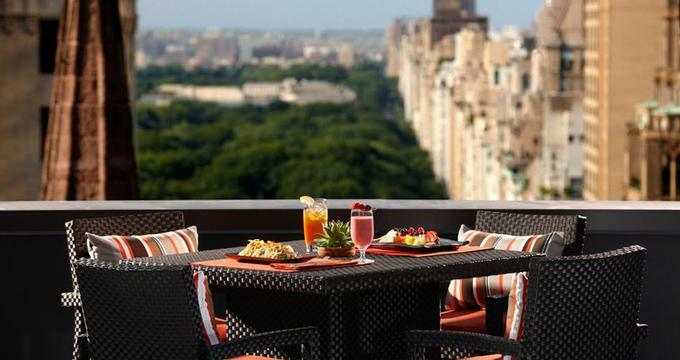 The Peninsula is a romantic New York hotel situated on Fifth Avenue and 55th Street. Whether you are visiting the city on business or pleasure, the hotel offers a full-service spa and health club, several restaurants and bars. You will be near famous shops, museums and attractions such as the Rockefeller Center, Carnegie Hall, St. Patrick's Cathedral, Tiffany's and the Apple Store. The hotel's 239 guest rooms and suites are decorated in a classic contemporary style with Art Nouveau accents. The rooms feature double-glazed windows and marble bathrooms with mood lighting. All of the rooms are equipped with the latest technology, catering to the business traveler. The Spa and Health Club has a glass-enclosed swimming pool, fitness center, jacuzzi, a steam room and sauna. The facility measures 35,000 square feet and encompasses three levels of the hotel, including a seasonal sun deck with views of Manhattan. Guests can book a personal training session and indulge in relaxing spa treatments. Daily classes include aqua-aerobics, body sculpting, low impact aerobics, pilates, yoga, jazz and tap dancing. After your workout, the Melange Salon can help you get ready for an important lunch or dinner date. Find out more about city spas. The hotel has several restaurants and bars which attract the business crowd. FIVES serves "Atlantic Rim" cuisine in a relaxed setting while the Bar at FIVES offers wines by the glass and live piano entertainment. For fabulous views of the skyline, visit The Pen-Top Bar & Terrace. The bar is also available for private parties during the warmer months. The Gotham Bar & Lounge on the Lobby level serves afternoon tea, light refreshments and evening cocktails. Whether you want a lavish rooftop wedding reception or an intimate celebration in a luxury suite, the Peninsula New York offers couples many great options. The hotel can accommodate up to 85 guests for a formal banquet of 180 for a cocktail reception. You will be right next to New York's Central Park and Fifth Avenue where you can have you photographer take stunning photos. Event consultants can help you plan every aspect of your dream celebration, including the rehearsal dinner, ceremony and the brunch. Hotel consultants work with several preferred partners, including florists, musicians, car companies and photographers. The chefs can prepare a variety of dining options, from traditional to contemporary. You can serve your guests a lavish buffet or an elegant five-course meal. Start your celebration with a rehersal dinner overlooking the Manhattan skyline. Ask about preferred group rates for your guests. Doubles from $325 USD, depending on the season and availability.